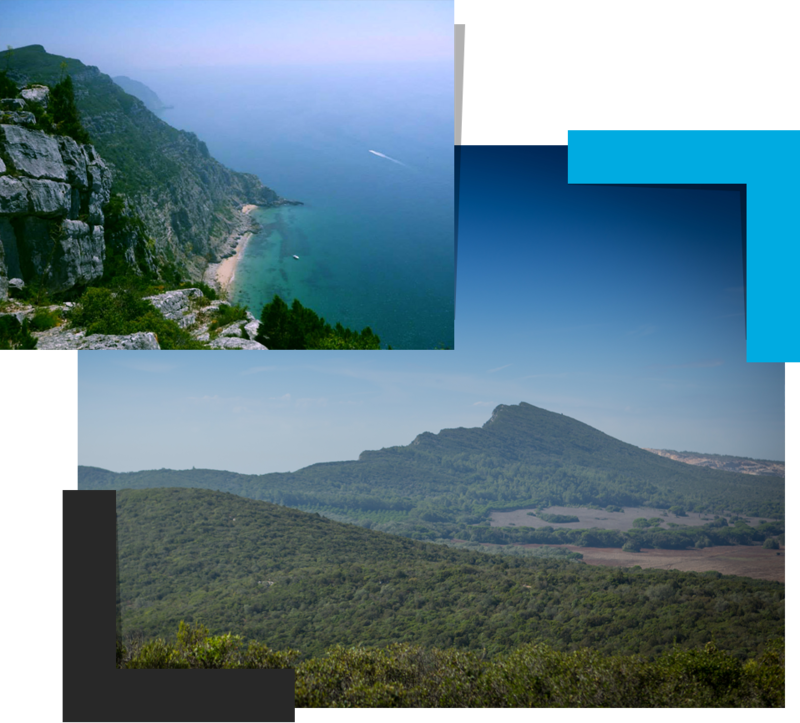 With this project, we pretend to promote the valorization of the natural Park of Serra da Arrábida , in its Natural and Cultural Heritage. So, it is with satisfaction, profound and rigorous knowledge, that we pretend to show one of the most beautiful and magnificent places of the Mediterranean area of our country. Each ride has its specificities: hiking distance, proper season, difficulty level and average duration. We want to present you with wonderful places, sometimes hard to reach, exclusive pristine beaches, bays, dinosaur footprints, as well as the highest peaks of our region. Discover on the promontory, on a ledge of the Jurassic cliffs located in the mysterious Espichel Cape The second cape more Western of Europe,the incredible footprints of dinosaurs. Are an ichnofossil of tracks left by saurops and theropods, about 150 million years ago. A location simultaneously isolated and insulating, desolate, rough where the mountain´s lush and vigorous vegetation is nearly impenetrable by man and where the promontory´s absolute aridness is uninhabitable, but to where people were attacted because of the site´s frontier-like and mysterious nature. The point of this hike is the hidden beach of Baleeira that in former times served as port for natural shelter to the boats fishing in the open sea. This beach are composed by Pebbles and rolled stones. The waters are calm and transparent in this narrow cove lined by huge escarpments. Is located near to the misterious Espichel Cape, the second westernmost cape of Europe. The hike begins in the remote village of Azoia, before the second westermost cape of Europe. 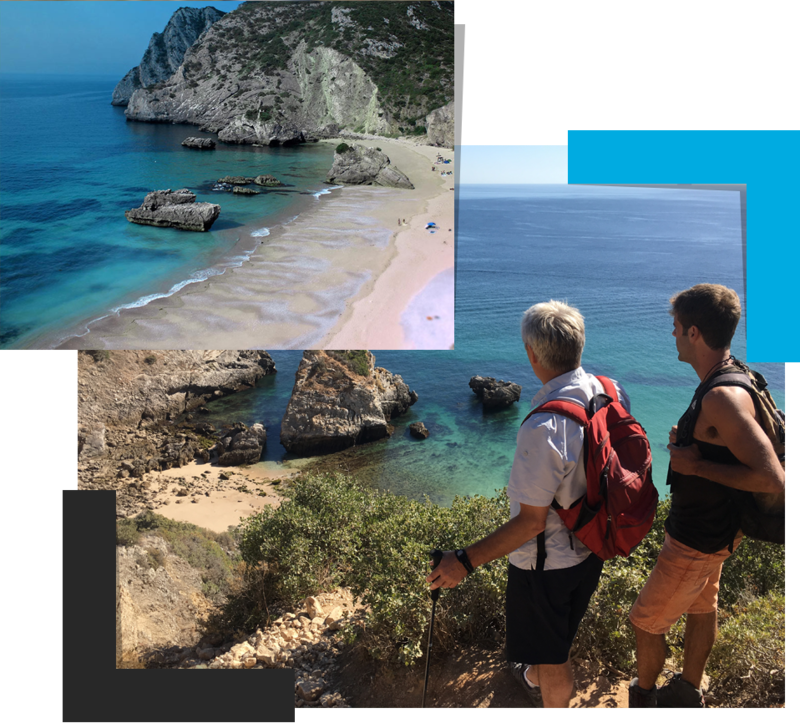 The hike is entirely along the coast with great views for the south coast where it is possible to watch the Atlantic Ocean and the big limestone cliffs, during springtime and summertime we have a high possibility to watch the comunity of dolphins close to the coast. When you reach the beach you can have a refreshing dive into the calming waters full of life and enjoy this peaceful place. The Hell's beach, also known as Penedo Beach it's a famous place among fishermen. On stormy days this beach is swallowed by big waves and it becomes impossible to berth. 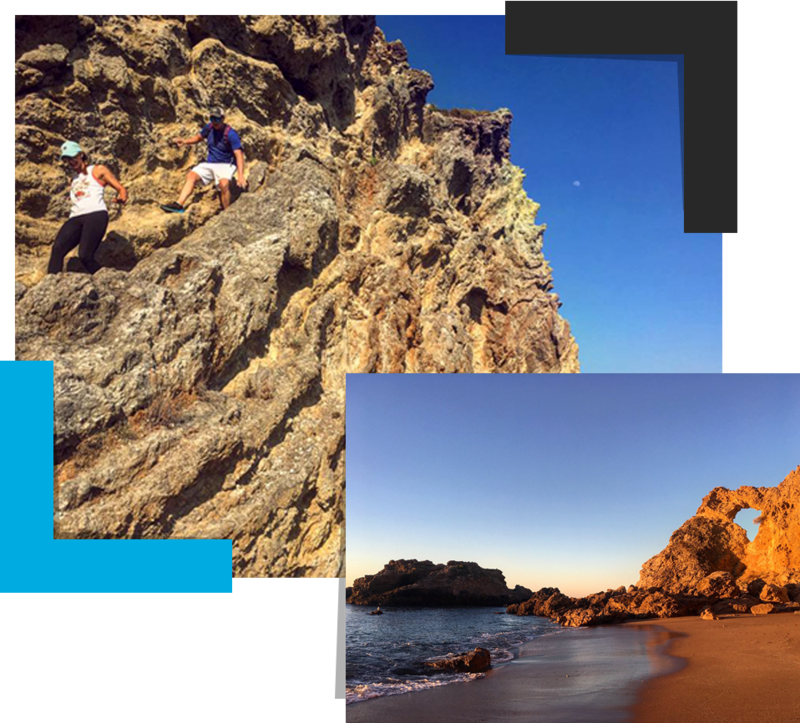 Usually it's a beach with calm waters with a fantastic morphology, one of the highlights is the famous circle of rock. Is a sandy beach with a darker sand than normal. It is located in front of an imposing vertical rock that protrudes from the cliff, shrinking the strip of sand. The view from the top is fantastic. The beach is composed of pebbles and blocks of considerable size. It is located in a small cove, the seabed is rich in biology and geological events, attracting diving enthusiasts. The Access to the base of the escarpment is complex with medium-high difficulty degree. This is our longest route, but also the wildest. The landscape is full of magnificent bushes that surround us and centenarian oak trees. After following alongside the cultivation fields, we'll head towards the cliff slope via zigzagged paths through the middle of dense vegetation. When we reach the top of the mountain (381m), the sea appear. This is the highest cliff of the continental Europe and is an excelent place to rest and admire the surrounding landscape. To climb the mystical Risk Mountain Range is not only an adventure, but also an experience you will remember for the rest of your life. 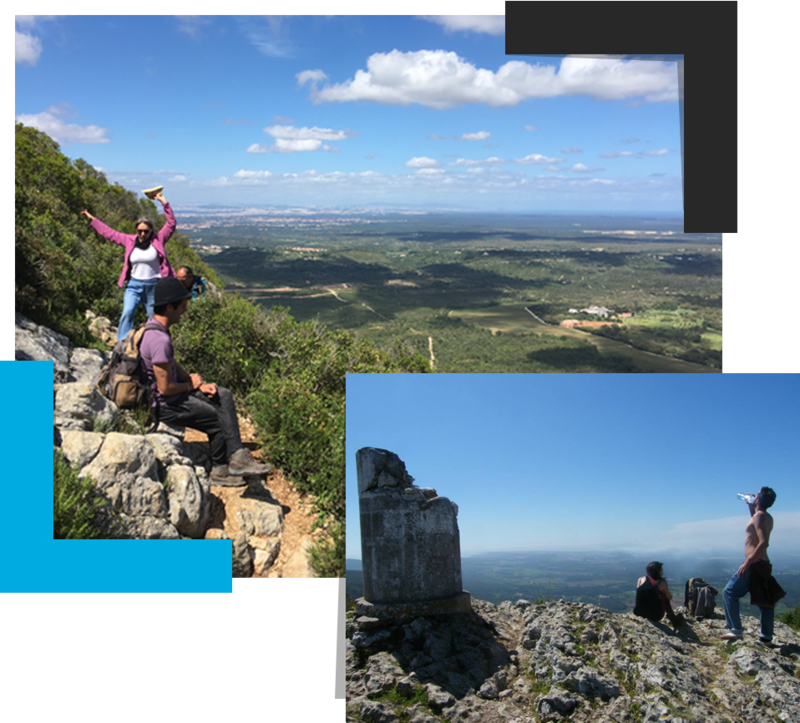 The objective of this cache is to take you to the peak of Formosinho, where you will be at 501 meters of altitude and will enjoy an amazing panoramic view over Setúbal peninsula, Serra do Risco and the Lisbon's coast, Tróia, Grândola mountain, the Alentejo and the Atlantic. Arrábida presents a series of specificities that, together,justify the presence of plant communities that are unique in the world and rich in evolutionary history, forming unique dynamics of ecological succession, in other words, an outstanding plant landscape of great singularity.This is a physical and emotional experience that will take you to the top of the Arrábida mountain, a spiritual place of contemplation of mother nature. This trail offers impressive views for the Atlantic Ocean and the opportunity to discover the most hidden beaches with natural pools at every turn. The degree of difficulty is Med/Low; approximately 8km trail begins at Bicas beach, and leads to the famous footprints of Dinosaurs near Espichel Cape. The trail follows a well-trodden path lined with arrows on some rocks guide the way. Spring is the best time to take in the beauty of the flowers growing in the white, sandy streambeds, and the vivid yellows, purples, and indigos of the flowering bushes. Due to the hot, dry weather conditions along the Wild West Coast, hikers are urged to bring plenty of water and sunscreen. 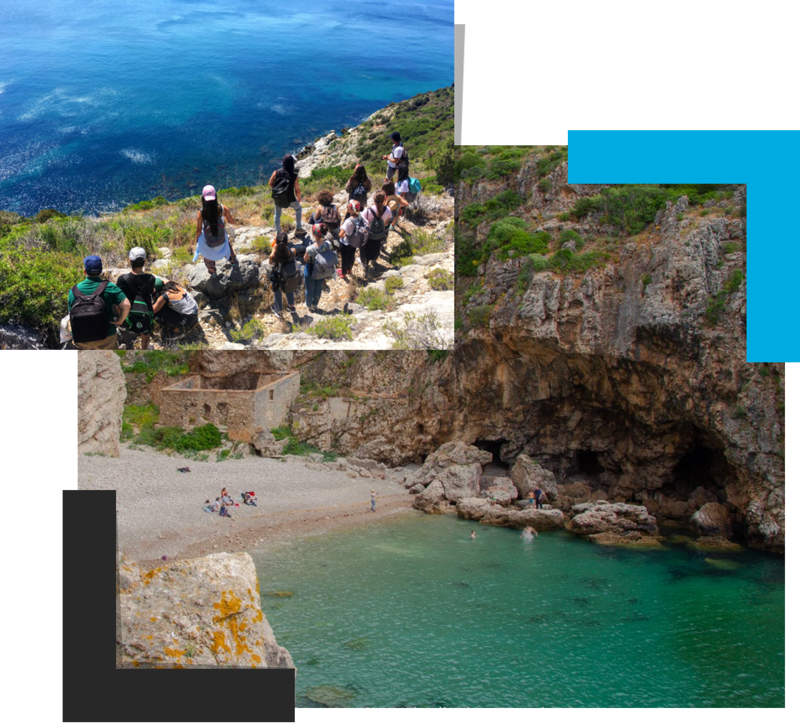 Look Around Tours invite you to explore the hidden beaches of Arrábida Natural Park. They combine the joy of discovery with the appeal of having something special all to yourself. The sand is laden with shells and the water is clear with different maritime species, sometimes is possible to watch some dolphins. It’s peaceful and unforgettably gorgeous. 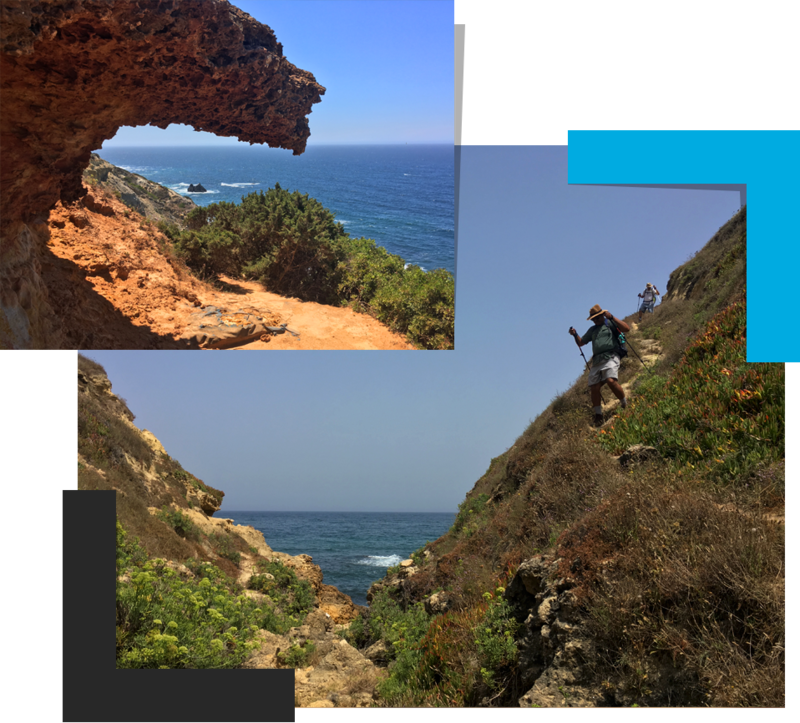 This hike starts in the fishing harbour of Sesimbra to the famous wild beach of “Ribeiro do Cavalo”. Is classified as the " The Caribbean Portuguese " , by the color of it´s waters. Only accessible by foot or boat, continues to be a secret of Sesimbra coast.. When we reach the wild beach we will have free time to dive in the transparent waters. Is impossible you not love this beach… Quietness, scenery, environment, simply great! 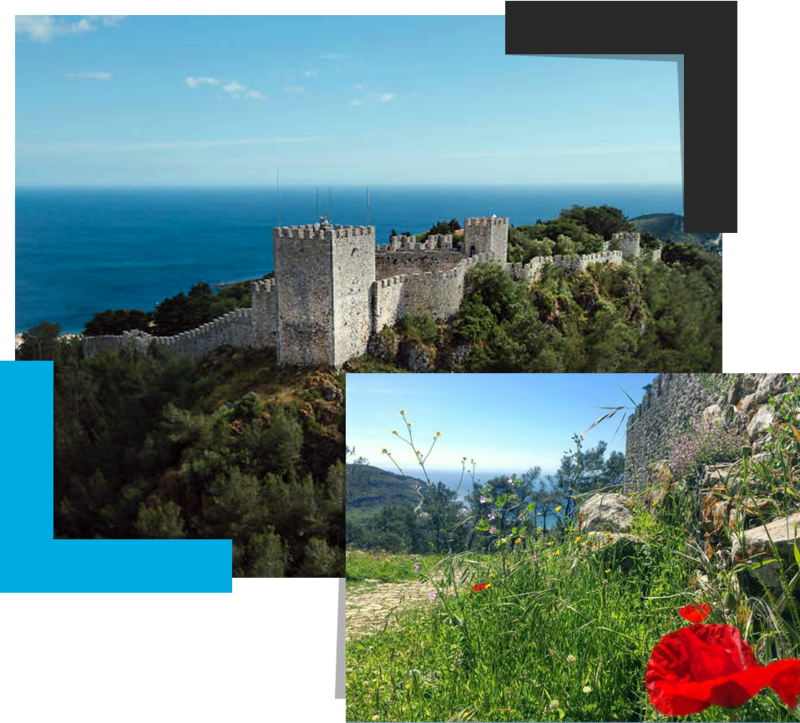 Climb the hill of Sesimbra to have a stroll along the battlement of the Moorish castle. Here, you will plunge into the atmosphere of the Middle Ages. This tour is for newcomers to hiking and history lovers. 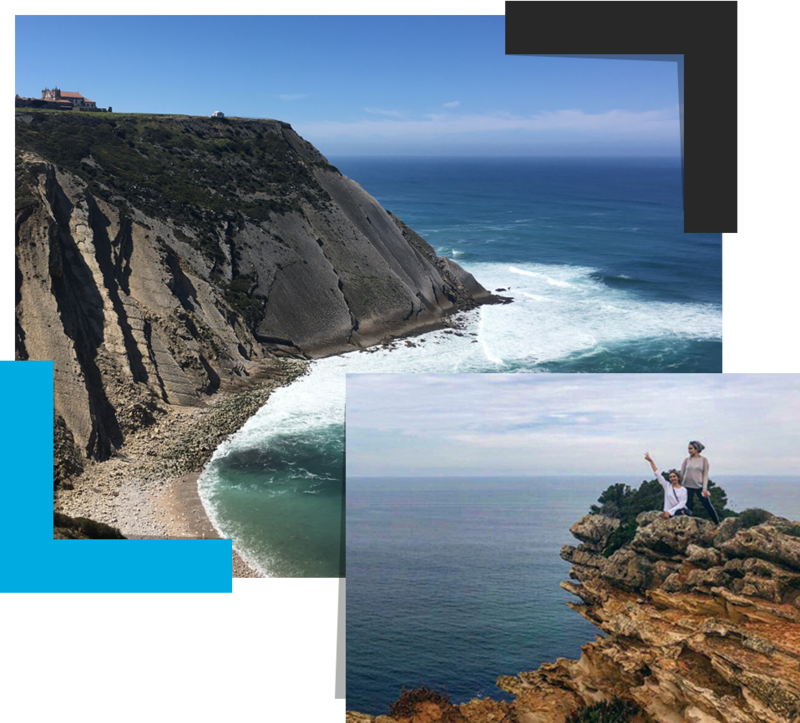 Walking up the hill of 230 meters will be rewarded of panoramic view over fishing village of Sesimbra, Lisbon, Serra da Sintra and Serra da Arrábida. Inside the castle, discover the ruins of the eight hundred year old buildings. We’ll also meet one of the wonders of Sesimbra - the Church of Santa Maria. Its interior is decorated with traditional blue glazed tiles. 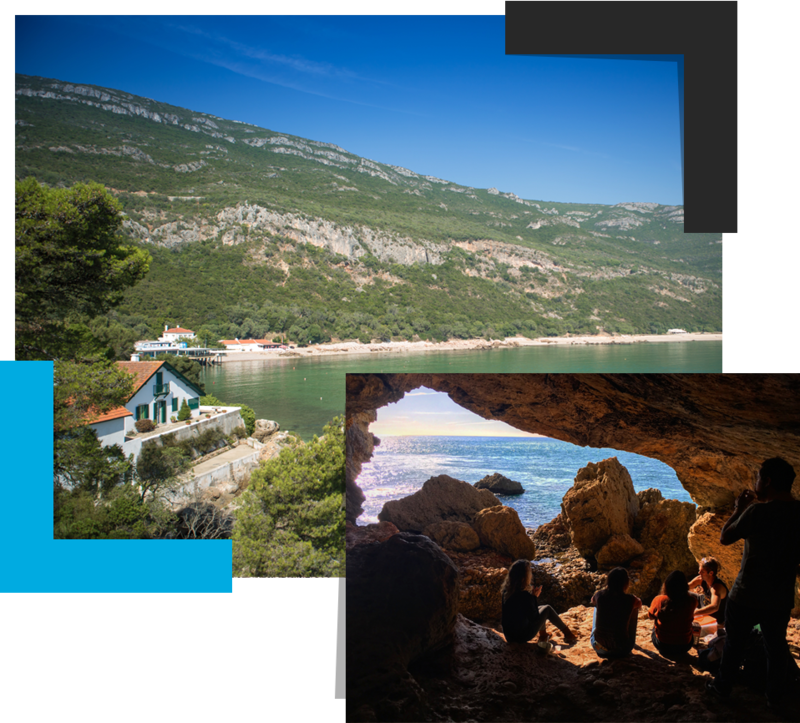 *This tour is possible to combine with ARRÁBIDA BEACH TOUR for a special price. 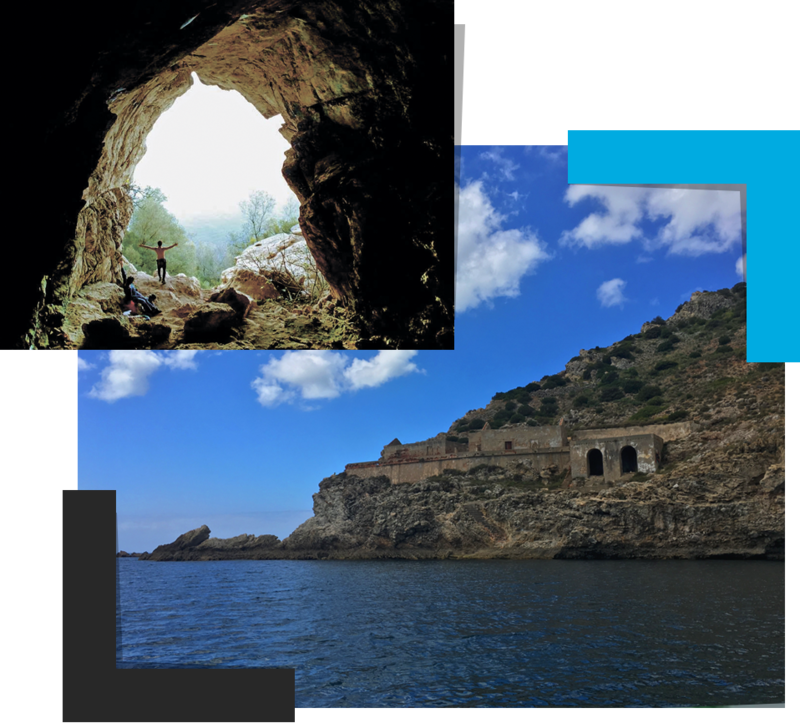 This trek starts in the Achada mountain range on a trail lined with lush vegetation towards a Phoenician cave (Lapa da Cova), located on a steep and steep escarpment, 260 meters above sea level, being visible from a long distance from the Ocean. The access is difficult and demanding due to the strong slope of the escarpment, special care is required. When you arrive, you can admire a huge cavity in the form of a "gothic arch". This is the westernmost known Phoenician Sanctuary grotto. “Lapa da Cova” itself is visible from a long distance, which contributes to its natural relevance in the horizon of eventual "arrival rituals" - former navigators who would be grateful for the success of their epic voyages, gratifying their gods with cults, offerings and rituals. After visiting this sacred site and contemplating a singular landscape, you walk down to the "Calhau da Cova", which is a small bay, many years ago served as a shelter for several fishing vessels and also accommodation for fishermen, who occupied places near small coves. Calhau da Cova is protected to the north by the cliff of Serra do Risco, by the highest limestone cliff of continental Europe with a height of 381 meters. The landscape is breathtaking. This mysterious calm bay with transparent waters, invite to a refreshing dip. On the return we face a technical climb with small stones that will guide to the meeting point. This is a course with a high degree of difficulty recommended for experienced participants.